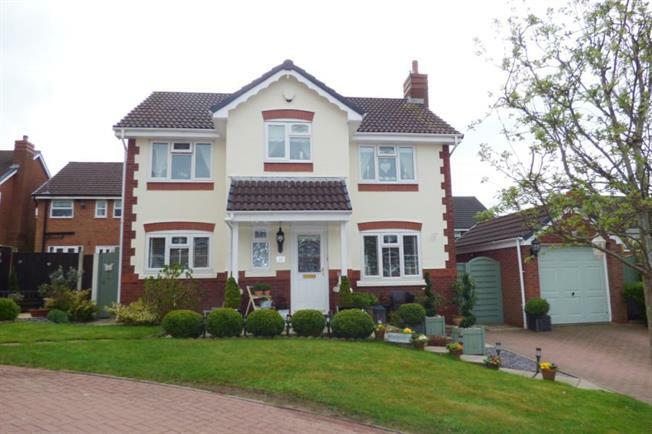 4 Bedroom Detached House For Sale in Warrington for £309,950. Unquestionably the most well presented property we have been asked to offer for sale all year and it is essential that all prospective buyers view this delightful home to fully appreciate what is on offer. Located in a superior position boasting a large front garden which enjoys a generous double width block paved driveway allowing off-road parking for at least four cars and leading to the detached garage. The gardens are a credit to the current owner and feature a beautifully tended access via the stepped pathway leading to the equally impressive storm porch with an Old English geometric designed tiled floor. The minute you enter the stunning entrance hallway is will be evident what type of property is on offer and this high specification is continued throughout the house. The ground floor boasts a lovely cloakroom/WC off the hallway which also allows access to an understairs storage area and a spindle staircase to the first floor. An amazing dual aspect formal living room is staged to impress and enjoys plenty natural light and now allows access to the Victorian style conservatory which doubles up as the dining room. The former dining room is now presented as a snug and enjoys views over the private established gardens and also allows access to the breakfast kitchen which features a modern fitted suite with several integrated appliances and access to the separate utility room. The first floor accommodation will again stun prospective buyers due to its high quality finish and boasts four wonderful bedrooms of which three are generous doubles and the fourth also measuring over 11ft at it maximum and with large fitted wardrobes setting this property aside from other designs both on this estate and other neighbouring homes. Both the main family bathroom and the master en-suite have been upgraded to offer modern suites which will appeal to most buyers tastes. Externally the garden to the rear has been carefully landscaped and enjoys a large seating area off the conservatory as well as a more secluded patio sitting alongside a large lawn making it ideal for families with children. This property is only one of 10 exclusive homes in this sought after cul-de-sac and is offered for sale on a Freehold basis and falls within the school catchment area for Great Sankey High which is within walking distance.